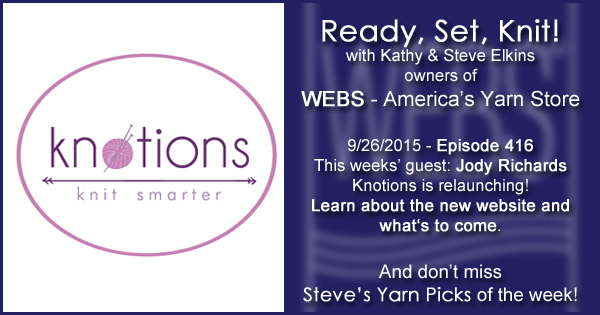 This week Kathy talks with Jody Richards, founder of Knotions Magazine. You may recall this free online knitting magazine from a few years ago, it featured quarterly issues with about a dozen patterns each, great articles and tutorials. Good news, it’s back! While doing some site upgrades and maintenance Jody felt it was time to bring it back (and we’re all glad she did!) The new site will feature everything you used to love as well as great designer interviews and it’s mobile friendly. Knitters Pride Royale Gift Set – Pre-order Now! Fall classes are open. Register now, they’re filling fast! Our annual Knit and Crochet for the Cure is happening Sunday, October 4th. 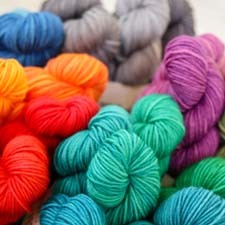 National Spinning and Weaving Week is coming, Oct 5-10! Louet owners Dave and Pam Van Stralen will be at WEBS Oct 9+10, try out all their beautiful products! Sign ups are open for our annual bus trip to Rhinebeck – get your seat now they’re almost gone! This entry was posted on Saturday, September 26th, 2015 at 9:00 am	and is filed under Ready, Set, Knit Podcast. You can follow any responses to this entry through the RSS 2.0 feed. You can skip to the end and leave a response. Pinging is currently not allowed.